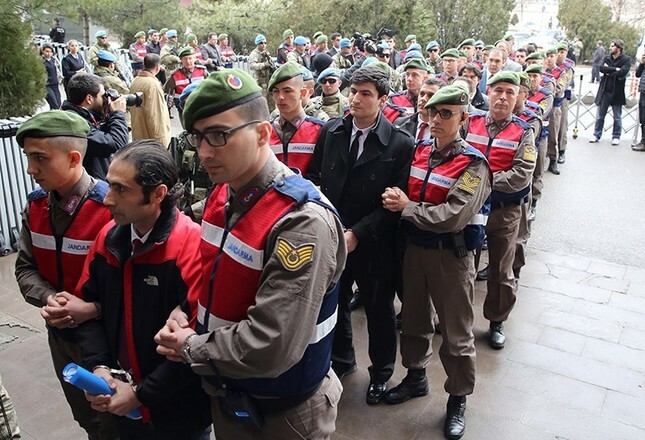 The trial began on Monday in the killing of a Turkish soldier who became a national hero after shooting dead one of the suspected ringleaders of last year's foiled coup, which is blamed on a small junta loyal to the Gülenist Terror Group (FETÖ). Sergeant Ömer Halisdemir killed Brigadier General Semih Terzi on the night of July 15, breaking the command chain of the plotters. Seventeen officers face four life sentences while prosecutors are asking for five life sentences for Lieutenant Mihrali Atmaca, who is accused of fatally shooting officer Halisdemir. Putschist soldiers are also facing charges for attempting to topple the government and assassinate President Recep Tayyip Erdoğan. Halisdemir was deployed in the Special Forces Command when pro-coup troops started taking over military bases across the country amid fierce resistance by the public, police and soldiers against the putsch attempt. Zekai Aksakallı, the commander of the Special Forces, managed to evade coup troops and telephoned Halisdemir to inform him about the individuals behind the coup. One of them was identified as Brig. Gen. Terzi, who flew in from another city in an attempt to take over the base on the night of the coup attempt. Commander Aksakallı ordered Halisdemir to kill Terzi in order to prevent the coup. Officer Halisdemir valiantly followed orders and fired several fatal shots at Terzi as he entered the base flanked by heavily-armed soldiers. Halisdemir died heroically, sprayed with bullets by Terzi's troops. After word of his actions on the night of the coup attempt got out, public sympathy poured in for the officer who had worked as an aide for Aksakallı for nearly two decades. Hundreds of babies born after the coup have been named Ömer Halisdemir as a tribute, and hundreds of thousands have visited his grave. Parks, schools and other public places have been named after Halisdemir, while a cottage industry of souvenirs to preserve his memory has emerged. The courtroom was packed with security forces on Monday, including police with shields behind the suspects, as the judge confirmed the identities of those on trial. Ahmet Kara, a non-commissioned officer like Halisdemir, was accompanying Semih Terzi when the latter was about to enter the military base where he was killed. Kara, one of 17 defendants, told the court that he was not aware that it was a "coup" when he, Terzi and other troops arrived in the Ankara headquarters of the Special Forces Command. "If I knew as much as Halisdemir did, I would have killed Terzi too," he said. Kara said Terzi never spoke about a coup when they flew together to Ankara aboard the same plane. He said he did not have a working cell phone and did not watch TV on the coup night, insisting he never heard that a coup attempt was unfolding while he was accompanying Terzi as the general's aide. "I was behind him while he was walking towards the (Special Forces headquarters) when I heard gunshots. I called for an ambulance," he said, recounting the moment Terzi was shot. Kara claimed he only found out about the coup attempt when he overheard other officers at the military hospital to which Terzi was taken. Ali Güreli, another non-commissioned officer who escorted Terzi as he was preparing to take over the Special Forces Command, said he believed they were in Ankara, where they flew from Diyarbakır, "to protect the parliament" after he heard of extraordinary military activity in Istanbul and Ankara. Güreli said he did not hear Terzi speak to anyone by radio while they were aboard the plane to Ankara and never heard any conversation about a coup while he and the other soldiers were flying there. The coup was blamed on the Gülenist Terror Group (FETÖ), led by Fetullah Gülen who lives in a self-imposed exile in U.S. state of Pennsylvania. The men went on trial after 47 suspects, mainly soldiers, appeared in court for the first time on Monday in the southern city of Muğla, accused of plotting to assassinate Erdoğan during the coup attempt. They are among around 43,000 people arrested in the aftermath of last year's attempted overthrow with the country facing the largest judicial process in its history.